One of the major problems with the Jack the Ripper Tours in London is that they’re just so popular. Indeed, it could be argued that the walks that follow in the footsteps of the World’s most infamous serial killer are amongst the most popular on offer, which is why so many companies now do them. The great thing about our walking tour is that it is nearly always fronted by one of the World’s leading experts on Jack the Ripper. Richard Jones, John Bennett and Philip Hutchinson have all written best selling books on the case and you will have seen them being interviewed as expert interviewees on virtually every television documentary over the last twenty years. No other company comes close to matching us for the depth expertise that we can offer you. In addition we are different to the London walks that start from Tower Hill Underground Station in that we actually visit sites that are connected with Jack the Ripper! A question we frequently get asked is why doesn’t our Jack the Ripper walk start from Tower Hill Underground Station like almost all the others? The reason is, quite simply, it’s a terrible place to start a ripper walk. The problem with Tower Hill is that you need to walk for a good forty or so minutes before you actually reach a site that is related to the crime themselves. That entire forty minutes will be spent walking through modern streets lined with 20th, and 21st, century office blocks. There’s no atmosphere, and there’s no relation to the case. The first related site you will reach will be Mitre Square, which was the location where the fourth of Jack’s murders, that of Kate Eddowes, took place on 30th September 1888. In other words you start at the fourth murder, which is a bit like tuning into to CSI after the third commercial break! On the other hand, if you start your tour from our start point – Aldgate East Station – you’re beginning alongside the very place where the Whitechapel Murders began in 1888. 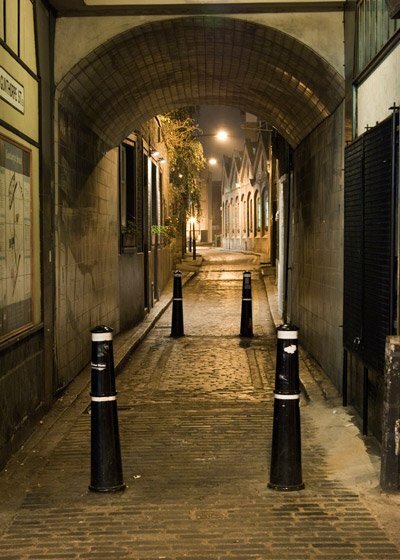 You then go into the sinister old alleyway along which Martha Tabram (who many think was the first of Jack the Ripper’s Victims) led her killer in the early hours of the 8th August 1888. As we do so we pass the old pub where one of the major suspects in the case actually worked. We then make our way round to the former pub where, on August 31st 1888, Mary Nichols, drank away her doss money and from where she went out into the night to raise the money to pay for a bed and, in so doing, stepped right into the arms of the ripper. From here our tour twists and turns through a warren of old and atmospheric streets that have changed little since they provided the back cloth against which the Jack the Ripper saga was played out. Next up, we arrive at the soaring white church that dominates the area today, just as it did in 1888 when every one of Jack the Ripper’s victims would have looked up at it on an almost daily basis. Just look at those photographs again. These are the actual sites you will see and streets you will walk through during the first 45 minutes of our tour from Aldgate East as opposed to the modern, skyscraper lined streets that you will have endured by setting out from Tower Hill tube. When you join us, we’ll greet you with a warm smile. Since you’ve booked in advance, and have prepaid, there’s no grubbing about handing over cash and then trying to find change. We tick your name off and that’s it. Because you’re part of a much smaller group you get to enjoy a much more leisurely stroll on which you can chat with your guide between stops. When you ask a question (which we positively encourage you to do) we won’t snap at you, or tell you to buy our book because the answers in there! We’ll give you a great tour, that is packed full of information and which will visit more murder sites in a more chronological order. So come along and give us a go and see for yourself that, when it comes to London walks, we offer a welcome difference.